Complexion: Hispanic Male Adult. Brown Hair, brown eyes. No known scars or tattoos. On October 9, 1993, when a 16 year old female resisted Zuniga’s romantic advances in the back seat of his car, he shot her in the head with a small caliber handgun. Near death for several months, the victim has partially recovered, but is still undergoing physical and emotional therapy. Immediately after the shooting, Zuniga returned to his home in Guadalupe, California, hid the gun, then fled to the Los Angeles area where family members live. 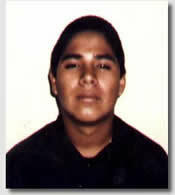 The whereabouts of Juan Ramon Zuniga, whose street name is “Kojak”, are unknown. The Santa Barbara County Sheriff’s Department has an arrest warrant outstanding for Juan Ramon Zuniga, charging him with attempted murder. If you have information regarding the whereabouts of Juan Ramon Zuniga, notify local law enforcement authorities or contact Santa Barbara County Sheriff’s Detective Bureau.